The final testing and sealing of the vote counting machiens at the Bayanihan Centre in kennedy Town on March 10. WILL Filipinos in Hong Kong retain the crown? 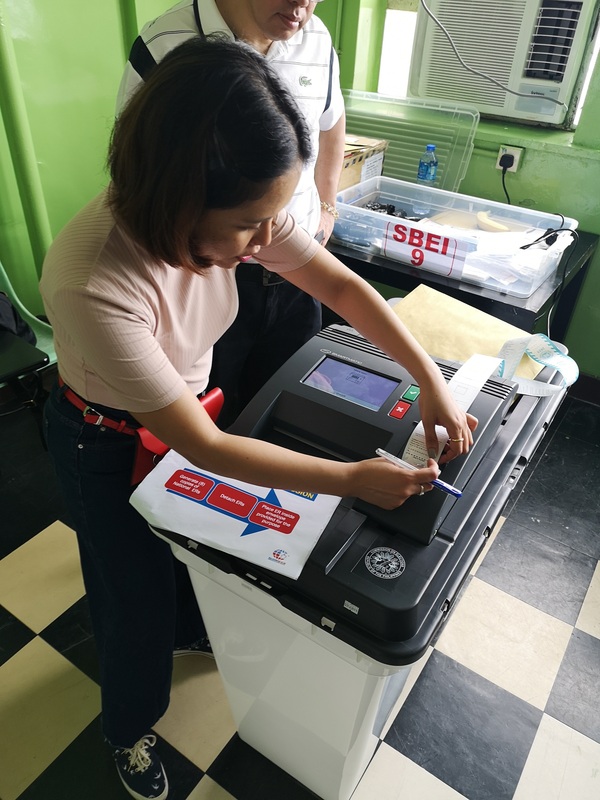 The monthlong overseas voting for the 2019 Philippine midterm elections begins tomorrow (April 13) as officials eye a 60 percent turnout for Filipino voters in Hong Kong. Consul Robert D. Quintin said the Filipino community in HK consistently had the highest voter turnout among the different Filipino diaspora communities around the world in past elections. “Historically, we lead when it comes to voter turnout,” Quintin said in an interview on April 10. “That (a 60 percent turnout) is what we want. I think it’s doable but of course our voters will have to do their part,” he added. Quintin said around 46,000 Filipinos in HK voted in the 2016 presidential elections, gaining the highest turnout and getting around 10 percent of the total 432,706 overseas votes cast that year. “The runner-up was Abu Dhabi which had a turnout of 40,000 plus. They beat us in voter registration but when it came to turnout, we led,” he said. “So at least, history will tell us that the turnout for HK voters is good,” he added. For this year, Quintin said there were 87,441 registered Filipino voters in HK. As of February, there were 214,018 Filipino domestic workers in the city and an estimated 20,000 more professionals and residents. “We have 87,441 active voters on our voters’ list so if 60 percent turn up, that would be a big thing and would prove that Filipinos in Hong Kong are aware and really want to exercise their right to vote,” he said. The precincts will also be open from 8 a.m. to 5 p.m. on Sundays while, on weekdays and other Saturdays, they will accommodate voters from 9 a.m. to 5 p.m.
“On the final day, May 13, we will be open until 6 p.m. If you are still waiting in line by that time, you will be able to vote,” Quintin said. “But of course, we are urging our kababayans to vote early and avoid the rush at the end of the voting period,” he added. Quintin also said that voters should come with their written list of favored candidates. Voters will be choosing 12 senators and one party-list group. “You can undervote but not overvote because your votes will not be counted if that happens,” he said. Once they arrive at the Bayanihan Centre, voters should proceed to the secretariat so that their names could be counter checked with the official voters’ list. Once it is confirmed that they are registered voters, they will then proceed to their assigned precincts. Quintin said the actual voting—shading the ballot and putting it into the vote counting machine (VCM)—could last from five to 10 minutes for each voter. “Once the voting ends at 6 p.m. on May 13, we will then have our canvassing. This will be open to the public and will be held at the Bayanihan Centre auditorium,” he said. The Commission on Elections (Comelec) earlier urged Filipinos abroad to exercise their right to vote in the May midterm polls. “Wherever you are in the world, you can vote and participate in the elections,” said the Comelec in its Twitter account. Comelec spokesman James Jimenez said there are several ways of casting votes for overseas Filipinos. the overseas voting period,” he said. Data from the Comelec – Office for Overseas Voting showed that there are 1,822,173 registered overseas Filipino voters this year. Majority of the registered overseas voters are land-based workers (1,779,140) while sea-based workers totaled 43,033. The Middle East and African Region had the highest number of voters with 887,744; followed by the Asia Pacific Region with 401,390; North and Latin American Region with 345,415; and European Region with 187,624. The Comelec said 41 out of the 83 countries/posts will be using VCMs. These posts include Agana, Calgary, Chicago, Honolulu, Los Angeles, New York, Ottawa, San Francisco, Toronto, Vancouver, Washington, Brunei, Canberra, Hong Kong, Kuala Lumpur, Macau, Kaohsiung, Taichung, Taipei, Osaka, Seoul, Singapore, Sydney, Tokyo, Wellington, Athens, London, Madrid, Milan, Rome, Abu Dhabi, Beirut, Doha, Dubai, Jeddah, Kuwait, Manama, Muscat, Al-Khobar, Riyadh, and Tel Aviv. Postal voting will be used in 29 posts, namely Brasilia, Buenos Aires, Mexico, Santiago, Bangkok, Beijing, Chongqing, Guangzhou, Hanoi, Islamabad, Port Moresby, Yangon, Ankara, Berlin, Berne, Brussels, Budapest, Geneva, Lisbon, Moscow, Oslo, Paris, Prague, The Hague, Vienna, Warsaw, Abuja, Cairo, and Pretoria. Personal voting will be used in 13 posts, including Dhaka, Dili, and Jakarta.